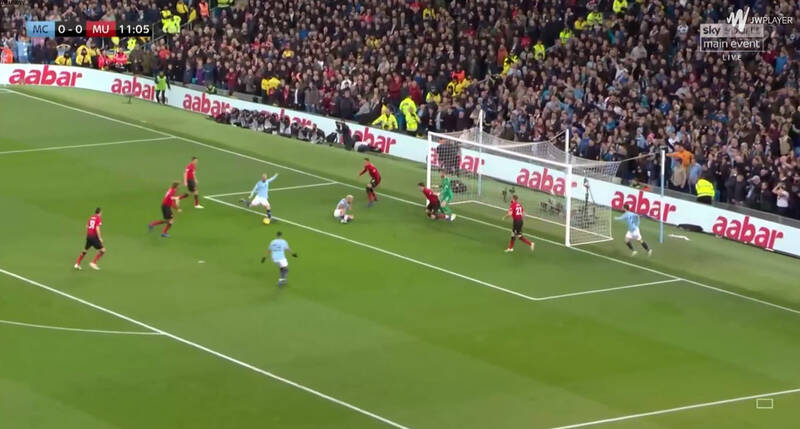 As we have discussed recently on the site, Manchester United’s defenders don’t exactly cover themselves in glory and the opening goal in this weekend’s Manchester derby was a prime example of that. 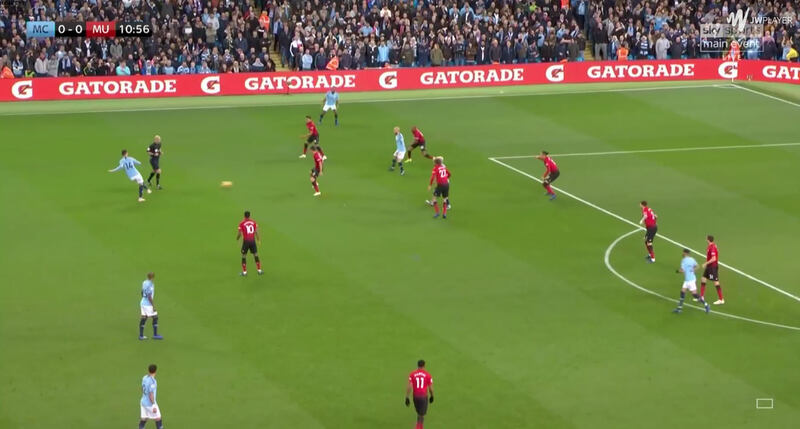 Manchester City’s possession starts with a freekick some thirty seconds before, but the intervening part of the move is just City passing it from flank to flank along their backline, trying to find a way to break down United’s deep defence. It isn’t until Aymeric Laporte decides to push forward on the ball that the move begins to get interesting. With United offering little space to work with, Laporte pushes forward to force someone out of position in the hope of freeing up a City player. It would make most sense for either Marcus Rashford or Jesse Lingard or both to close him down as they are closest, but Laporte is allowed to keep advancing, drawing Ander Herrera out from his deep position. Herrera and Nemanja Matic would stick very close to City’s attacking midfielders, frequently dropping into the backline to form a 6-3-1 and stop the back four from getting outnumbered when City’s midfielders moved forward. Herrera closes Laporte down, stopping him from pushing forward any further, but having to leave David Silva. Silva is picked up by Chris Smalling, although this means that Sergio Aguero is now free. City seemed to be targeting United’s right side in particular. 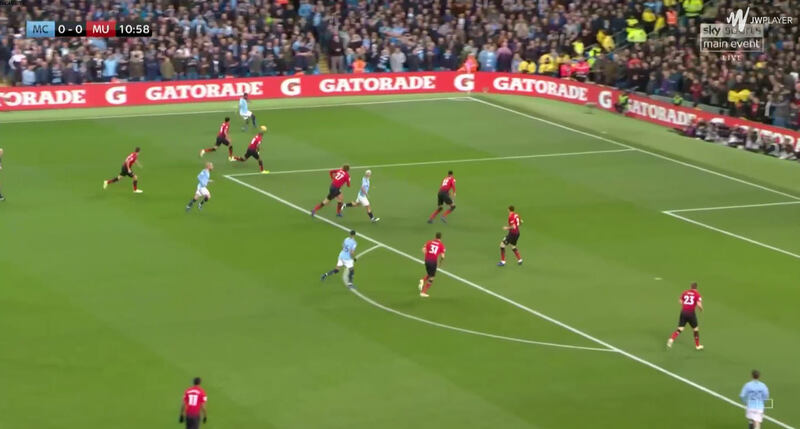 United’s defenders were sticking very close to their men, allowing them to easily get dragged up the pitch, while Ashley Young often seems to be unaware of runners in behind him, letting them go free rather than running back to defend, making him an obvious target for City. Laporte passes to Aguero. 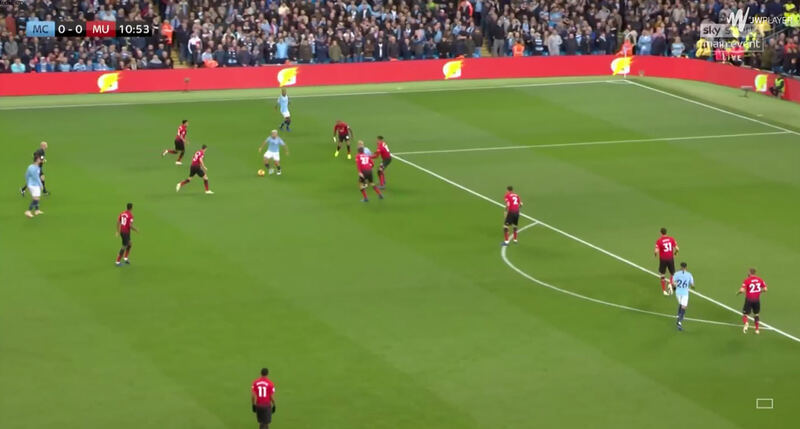 None of United’s defenders try to get tight to him, which gives him the opportunity to turn and shoot, but a clump of United defenders means there’s not a good angle. Herrera and Lingard close him down from behind, forcing him into a decision, and he returns the ball to Laporte. Aguero and Silva switch positions and the same move is attempted again. Laporte passes into Silva and this time Young is tempted out, sticking tight to Silva. His challenge is brushed off and Silva passes the ball to Sterling, who is left free due to Young getting tight to Silva. Sterling has the option of getting to the byline and pulling the ball back for a City attacker to finish or at least attempting to win a penalty. Preferring his right foot though, he cuts back, leaving United in a good position to defend despite being under threat just seconds before. Lingard and Young have recovered to neuter the threat of Sterling’s dribbling, while he has few passing options and, although he’s been given time to pick out a ball, United have packed the box with players to head away any cross. Sterling crosses anyway, sending in a good low bouncing ball along the six yard line. 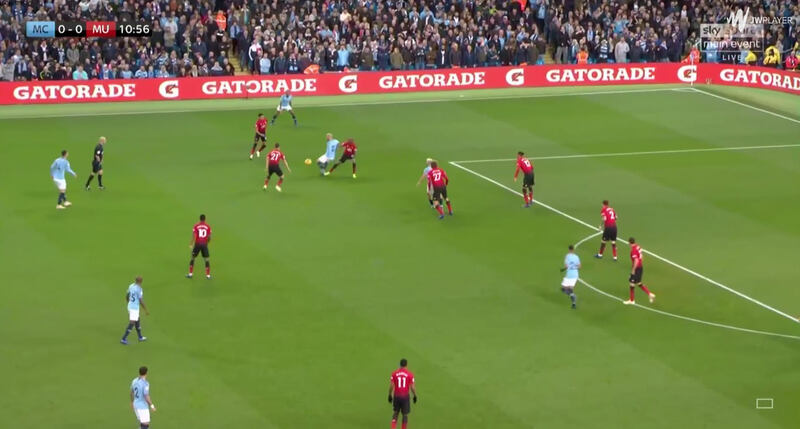 Although it’s a good ball, Lindelof should easily clear it with his right foot, but instead he leaves it, motioning with his arms as if it’s clearly going out of play. It isn’t. Shaw meanwhile has let Bernardo Silva get ahead of him. He starts out quite well, keeping track of him around the edge of the area, his head swiveling to check where the Portuguese has gone, but when Sterling shapes to cross Shaw’s head stops turning, allowing Silva to escape him. 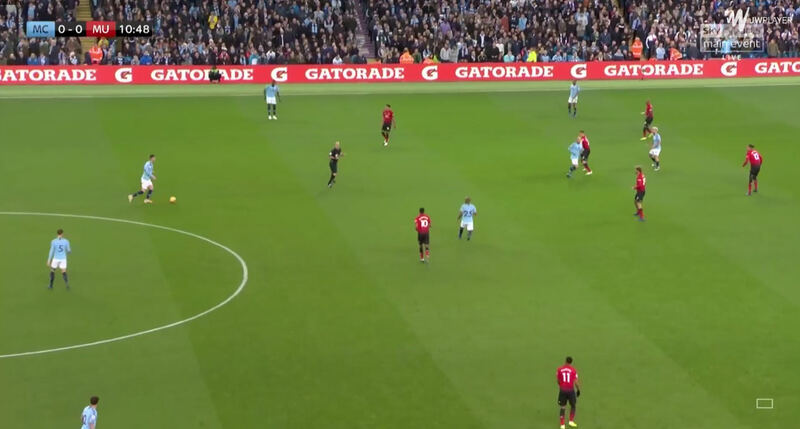 This is perhaps harsh on Shaw as he’s probably expecting Lindelof to clear it and he does react quickly when he realises he’s lost Silva, but his lack of awareness has been a pretty consistent problem for United. The defending at the other post isn’t great either. 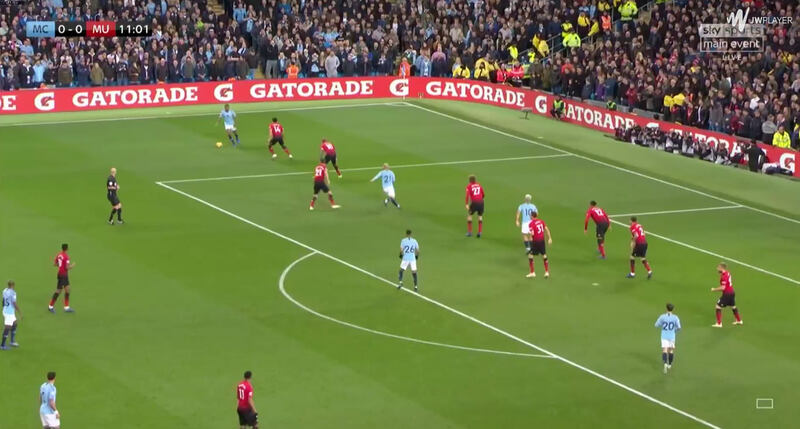 Silva squares the ball to his namesake who’s been left free and is given the time to take a touch and pick his spot at a leisurely pace, with neither Herrera or Fellaini making much effort to stop him despite both being in a position to do so. This also shows some of the problems with having midfielders drop into the backline to plug any gaps. 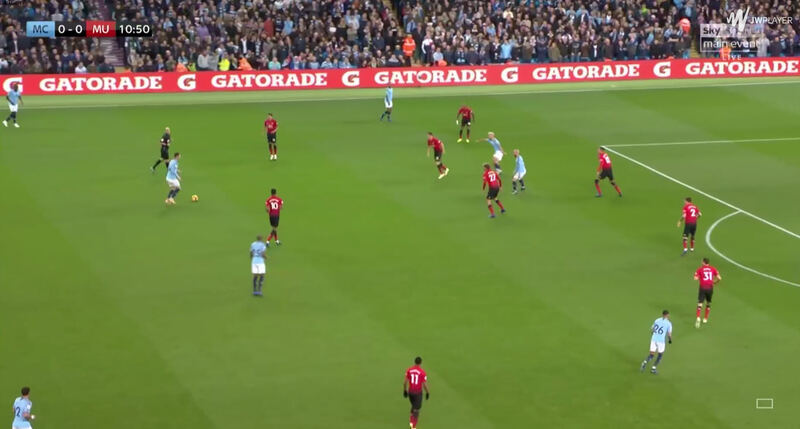 Fellaini and Herrera dropping into defence for the cross allows Young to stay wide and defend against Sterling, however they then need to move as defenders. 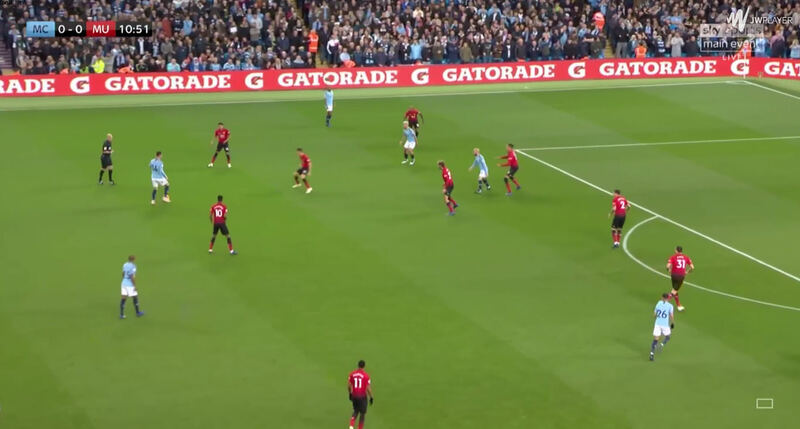 One of them should be moving to the back post like a right-back as, within the context of the cross, they are the ones covering that position, but being midfielders they unsurprisingly defend like midfielders, staying near the edge of the area. 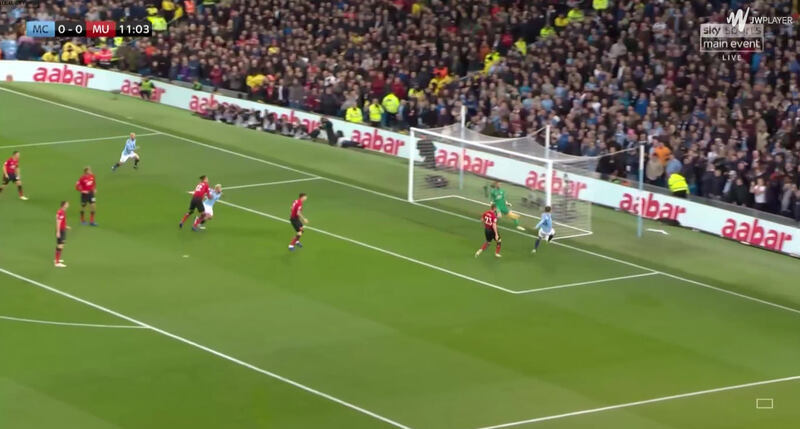 It’s not particularly surprising that it wouldn’t occur to them that they needed to track Silva, however their failure to close him down is bizarre: he’s in the six-yard box, what else is he going to do but shoot?